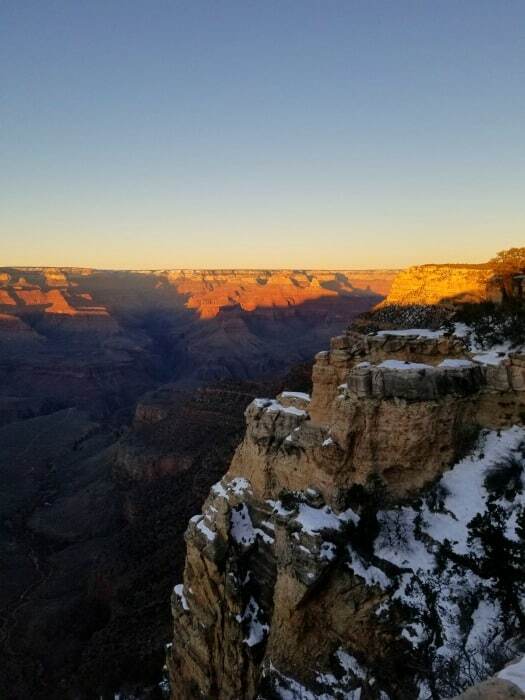 Visiting Grand Canyon National Park during the winter is amazing! 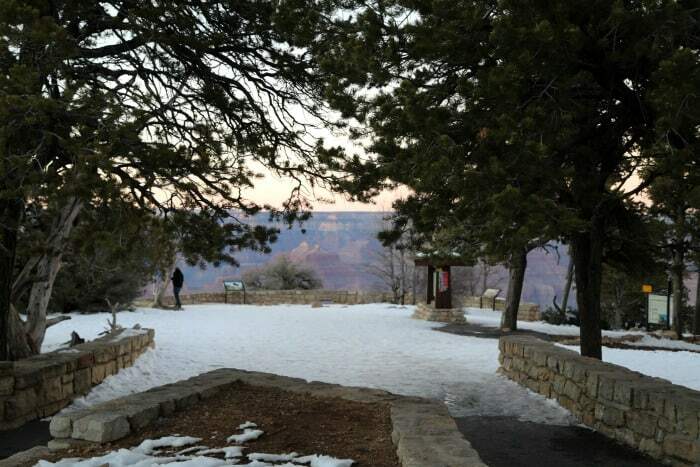 Grand Canyon Winter offers you the opportunity to enjoy the park in ways you can’t during the summer months. You can truly immerse yourself in this Arizona National park. We visited the Grand Canyon during the last week of January and could not believe how great the weather was and how few people there were in the park. The early mornings were chilly at 17 degrees and windy but as soon as the sun came up so did the temperature. We even got up to 45 degrees one day with stunning blue skies and barely any wind. 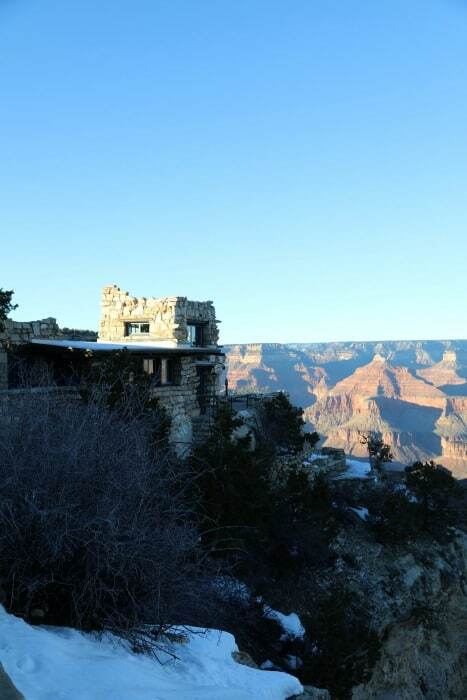 One of the best reasons to visit the Grand Canyon during the winter is the access you gain to the park. During the summer you have to be on a tour or ride the park shuttle bus to visit Hermit’s Rest and the west rim of the canyon. 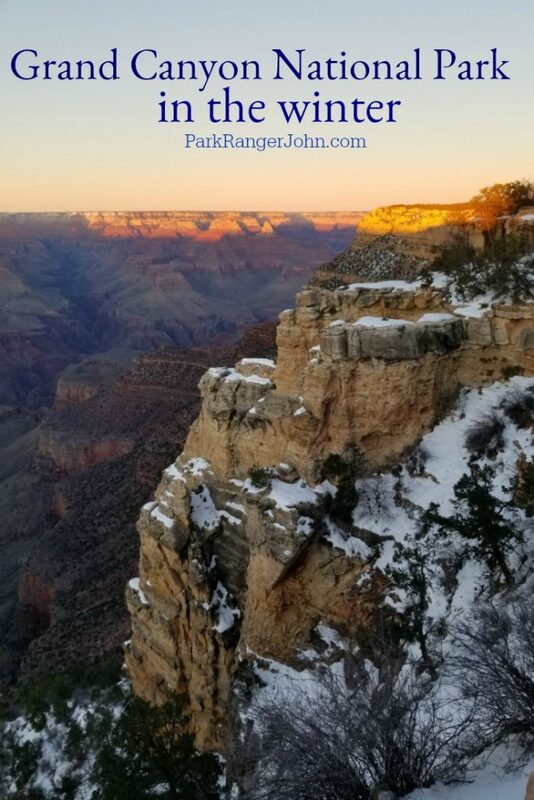 During the winter you can drive your car down the rim and stop at any and every pull-out and overlook you want to without having to worry about running to get on the next shuttle. You truly have the park open and available for you to enjoy especially since most days the crowds are tiny. We watched sunrise right outside the El Tovar and there were only 6 people the entire time we were outside. It was crazy how few people there were and how amazing the view was. What to do in the Grand Canyon in the winter? Frequently asked questions about visiting Grand Canyon in the Winter. Does Grand Canyon close in the winter? Driving from Phoenix to the Grand Canyon in the winter? The Grand Canyon is at 7,000 feet in elevation so weather can change quickly. During our visit in January, the temperatures ranged from 17 degrees before sunrise to 45 during the day not counting the windchill. We did not have any storms pass through while we were visiting but the park was covered in snow. Many of the trails and overlooks did have ice on them especially those that are north facing that do not get the direct sun. You can pick up crampons for your boots at many of the stores on the south rim. If you decide to wear crampons on your shoes make sure you do not wear them in your car, in buildings, or on concrete that does not have ice. The crampons can cause major damage to floors and the paint of your car. Another option to bring with you is a pair of YakTrax that can be slipped on and off your shoes. Hiking poles may also help if you want a bit of extra stability. Don’t forget to pack a warm hat (one that has ear flaps if possible), scarf and gloves. The wind was the hardest part during our visit and our ears paid for it since we forgot our hats with ear flaps. We stayed at three of the Grand Canyon South Rim hotels and loved them! We wanted to experience as many different ways to stay in the Grand Canyon as possible. You will want to make a reservation as soon as you know when you will be visiting the Grand Canyon in the winter. Actually, any time you are visiting the Grand Canyon you will want to make a hotel reservation as soon as you have your dates of travel. One great benefit for staying at a Grand Canyon lodge during the winter is the rooms have Keurigs in them. You can pack your favorite thermos and fill it for the day. The rooms come with a couple regular k-cups and 2 decaf cups. If you are picky about your coffee or love chai tea like my wife you may want to pack a box of your favorite drink with you. The Mather Campground was open along with the Grand Canyon RV Resort. If you plan on camping be prepared to clear snow from around your tent. 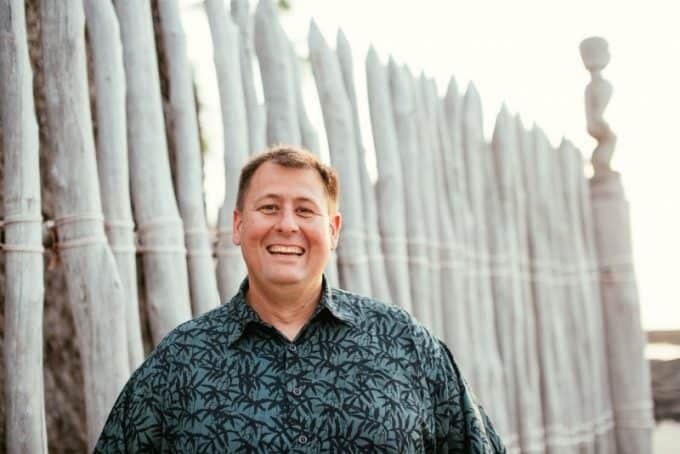 We made our reservations on Black Friday and were able to get amazing prices for the El Tovar, Kachina Lodge, and Bright Angel Lodge. If you are looking to plan for upcoming years this is a great way to save some money on your hotel nights! The best part of visiting the Grand Canyon in the winter is how much there is to do and how much freedom you have to move around the park. The visitor centers and stores are open and not as crowded as during the summer. Most of the trails are open you will just need to be careful with ice and snow on the trails. The best part is the rim drive is open to drive on with your personal car. You can drive to Hermit’s Rest and check out the entire rim without having to run for a shuttle bus or worry about how long you spend checking out an overlook. 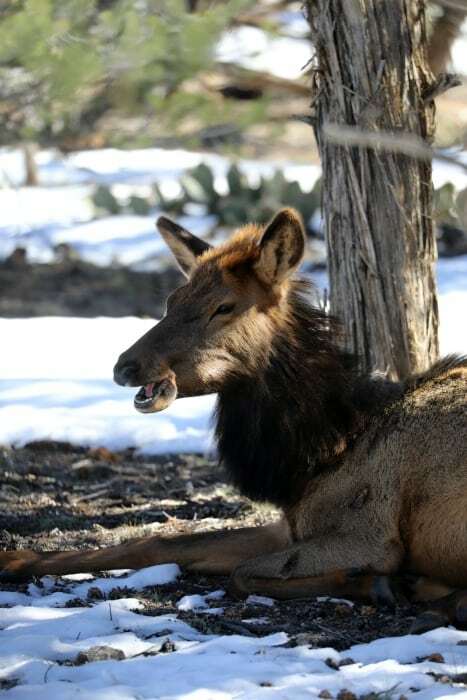 We saw elk and deer all over the Grand Canyon. There was a large group of elk wandering through the main visitor center parking lot one afternoon and then deer the next day. We also saw quite a few birds during our visit. 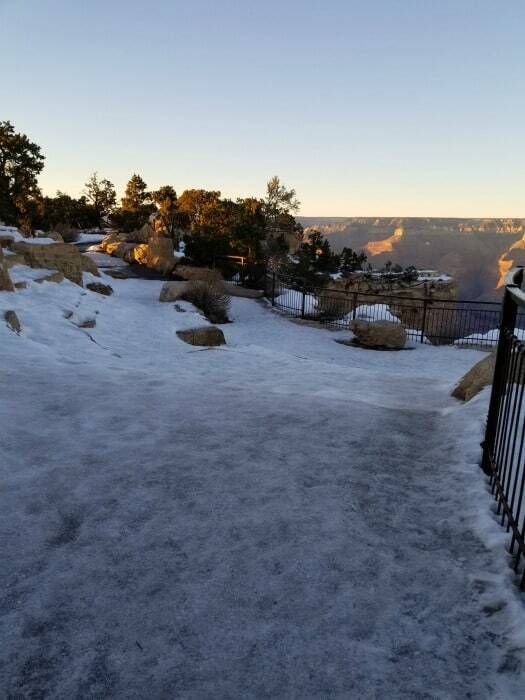 If you are planning on enjoying winter hiking in the Grand Canyon you will definitely want to be prepared for changing weather, ice, and windchill. We saw people hiking down to Phantom Ranch and along many of the hiking trails. The Grand Canyon Rim trail was fairly free of snow and ice in most places and made for great hiking with views of the canyon. If you are planning on hiking down to Phantom Ranch you will still need to stop into the backcountry permit office and talk with them. We heard that permits can be available the same day but if you know when you want to hike the canyon it is best to apply for one online ahead of time to make sure you get a permit. There are water filling stations available at Hermit’s Rest and at the lodges along the South Rim. The stores sell refillable water bottles if you do not have one with you. Make sure and have your ten essentials with you while hiking and also let people know what trails you are planning to explore. The south rim of the Grand Canyon is open year round. Most of the visitor services stay open and you can enjoy the entire park. 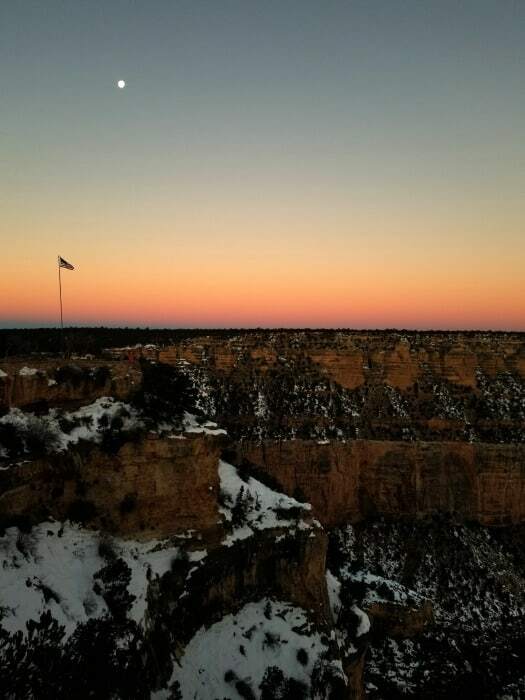 The north rim of the Grand Canyon does close in the winter. From Phoenix, you can drive to Flagstaff and then over to Williams and into the park. The road was clear of snow and ice when we drove it. Have so much fun!! The Grand Canyon is amazing in the winter. I am heading over to check out your site now. Love seeing Park Rangers share their passion for travel.